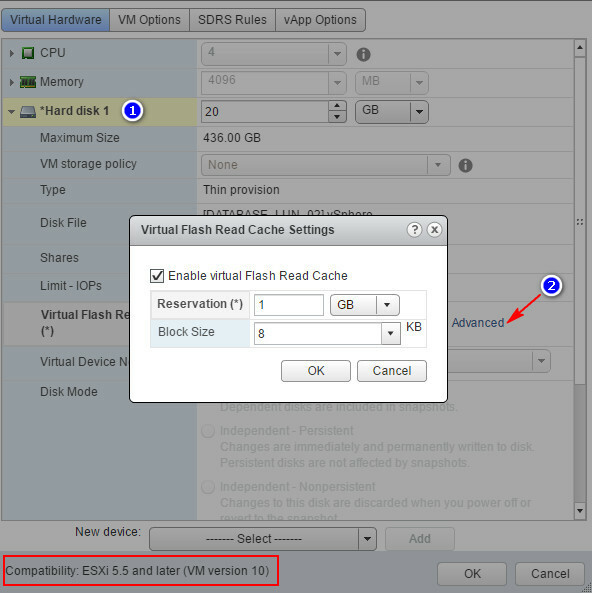 I’ve spent some time exploring and studying the use and configuration of VMware Flash Read Cache (vFRC) and its benefits. These are my notes. On a guest virtual machine, vFRC is configured in Disk configuration area. The virtual machine needs to be on version 10 hardware. vSphere needs to be minimum version 5.5. I took a baseline benchmark of a simple Windows Server 2016 virtual machine that had a thin provisioned 20GB disk using DskSpd (formerly sqlio). The virtual machine disk disk is connected to an IBM DS3400 LUN with 4 x 300GB 15k RPM disks in RAID-10. Some notes before running a test. This is geared toward SQL workloads and identifies the type of I/O for the different SQL workload. The important part of this shows that at 204MB/s throughput and 26k IOPs, I had average 2ms latency. Here is a view from my monitoring software, essentially validating the latency. At this point, I just need to get the SSD installed on the host and test VMware Flash Read Cache.